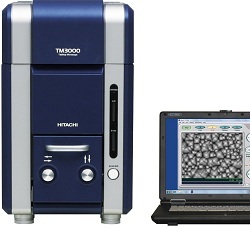 THE RECENT introduction of advanced energy dispersive spectrometry (EDS) systems by Bruker has equipped the Hitachi TM3000 tabletop microscope to work alongside a Bruker Quantax 200 to perform fully automated particle analysis. In particular, two modules of Bruker’s Esprit software – the Feature and Jobs modules – take much of the difficulty out of particle analysis operations. Hitachi says it is a simple procedure for the user to define the image processing algorithms (thresholds, filters, etc) to enable particle recognition. The user can also define the chemical classification of the various particles allowing the software to categorise or bin the results. An optional drift compensation system allows for any beam drift during long search/analysis runs, improving detection and analysis accuracy.